According to the latest rumors, Jennifer Aniston is now dating Vince Vaughn. The new relationship will undoubtedly require a celebrity relationship nickname, á la "Bennifer," "Brangelina," or "Tomkat." May I be the first to suggest, "Vaginaston"? You're welcome. I'll try to post a sample joke or two every Monday. That way, the few people who read my blog might actually find something to enjoy buried in this collection of news and plugs. Oh, and regarding the aforementioned Rachel Kramer Bussell, comedy aficionado and spanking editrix, I should point you all here (even though the post is pretty much a direct result of me mentioning her terrific and ongoing SSIOWY coverage in her blog previously-- and in return I'm mentioning that responsive mention of me in her blog in my blog. Thus, the infinite regress of the Internet continues unabated, I continue to self-promote, and all is right with the world). I got my first mention in The Apiary which is kind of like a gossip-column-blog, specifically covering New York comedians and the New York comedy community. It's the sort of thing people like me read, secretly hoping to see their name. And now I have. Which was exciting. Plus, they were nice enough to link to this very page. Anyway, my name-check was part of a discussion of the last (sold out!) 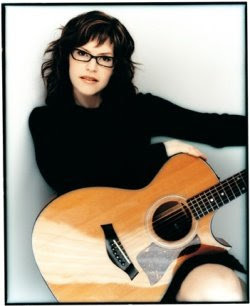 Sara Schaefer is Obsessed With You, with special musical guest Lisa Loeb. I was really pleased with this episode. I got to take the first pass at the time-travel plot, and the extra time we had to prepare gave me and all the writers-- the astounding Patrick Stubbins, Amanda Melson, Kara Lee Burk, and Sara herself-- a ton of time to punch up and expand on the script and make it high-larious. Some key plot points-- Amanda played "future Sara Schaefer," (despite looking nothing like Sara), who came back in time as to warn Sara about the doom that would befall everyone at the end of the show, but refused to give specifics for fear of changing the future. Kara Lee played "future Dan" (SARA: In the future you're a woman? ME: Yeah... turns out I've got a lot of unresolved issues that I won't deal with for another couple of years.") who came back in time with no scruples about changing the future. Eventually future Dan became Sara's personal assistant, helping with the aid of her total knowledge of the future, and I ended up getting drunk and sleeping with the future version of myself. At the end of the show we discover that the horrible thing that was going to happen at the end of the show was that all the messing with time has changed SSIOWY's theater into a movie house showing Ashton Kutcher's "The Butterfly Effect." Thankfully we're all saved from having to watch it by future Dan, who has brought back a tape of Sara's future E! True Hollywood Story, detailing her rise to fame. Thus, everything ends happily. The guests were also great. Lisa is just as cute as you would imagine, and she played three songs, including "Stay." It was one of those moments, where I was like, "Hey, I remember watching this video on MTV in high school. And now I'm standing back stage at a show for which I'm a writer, and she's playing it live," where I felt like, even if my career goes no further, this is kind of wonderful. That moment eventually passed though. Please pay me for my writing. Also, Chris Genoa, the novelist (and Sara's fiancee) was very funny-- you should read the post on The Apiary for more details. In addition to the shout-out at The Apiary, Rachel Kramer Bussel, the famed Lusty Lady and comedy fan wrote about us on her comedy weblog. She's been a big fan of Sara's show since way back-- certainly long before I was even involved with it, and I know everyone appreciates all her support (she even wrote a great interview with Sarah for Gothamist some time back). Anyway, like I said, it was a good show. We had three cameras taping it, along with some special sound equipment, etc., so maybe it'll get us into some comedy festival or something. Also, The Apiary mentioned that Jest Magazine's going national. They also call it "Mad Magazine for manchildren," which, to be honest, is pretty fair. I'm just glad people are paying attention, as I've been contributing regularly for almost a year now and I love it when the rag gets any publicity. Also, I actually got my first fan letter in Jest's most recent issue. Maybe I'll type it up for you guys when I get a chance. Say... Who's the Musical Guest at this Week's Sara Schaefer is Obsessed With You? In addition to our musical guest, Sarah will be interviewing Chris Genoa, novelist... and her fiancee. Pre-marital sparks are sure to fly. Also, someone might act like a monkey. See the show at Juvie Hall Sketch Comedy Theater, this Friday, June 17th at 8 PM. The address? 24 Bond Street, btw Bowery & Lafayette. Tickets are $8, through SmartTix 212-868-4444, or at the door. Seats are going fast. ...Oh, and happy birthday to me, this Sunday. Congratulations to Sara Schaefer, my pseudo-late-night-talk-show-boss, who appeared on last week's Best Week Ever. Oh, and a reminder: I can be seen at Church Basement, tonight at 8.